Kementerian Sosial Republik Indonesia - Kementerian Sosial or referred to as "KEMSOS" is the Ministry of Social Affairs of the Republic of Indonesia. The Ministry of Social Affairs is one of the ministry in the Indonesian Working Cabinet (Kabinet Kerja) which oversees the social affairs. The Ministry was formerly known as the Department of Social Affairs (Departemen Sosial or abbreviated as DEPSOS). The Ministry has its legal domicile in Jakarta and its head office is registered at Jl Salemba Raya No 28 Jakarta 10430. 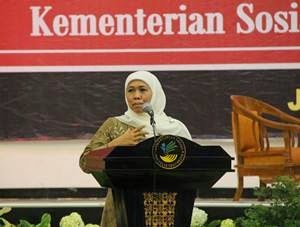 KEMSOS was lead by the Minister of Social Affairs (Mensos). Since October 2014, Khofifah Indar Parawansa was appointed by the President Joko "Jokowi" Widodo. She was appointed as the Minister of Social Affairs to replace Salim Segaf Al-Jufri. According to KEMSOS Profile as quoted by JobsCDC.com, the organizational stucture of the Ministry of Social Affair consist of 1 Secretariat General, 1 Inspectorate General, 1 Agency and 3 directorates. Citizens of the Republic of Indonesia (WNI). Maximum age 30 years old on 1 April 2017. Minimum Bachelor Degree or equivalent (S1/DIV), preferably majoring in Social Welfare / Social Work. Willing to be placed throughout the KAT empowerment location. Not in the status of a suspect case of any criminal offense by law enforcement officials. Not have affiliates and / or become members of political parties. Not tied to a job and / or other non permanent job. Have strong commitment and dedication in assisting the community. Have a good knowledge of local autonomy, the government bureaucracy, social welfare development, and the empowerment of Remote Indigenous Communities (KAT). Preferably with experience in similar mentoring ; disaster volunteers, humanitarian activists and other civil society. Able to perform coordination and cooperation. Able to create a work plan to identify and prioritize issues, and set employment targets. Initiative and able to solve problems involving the potential, resources, and stakeholders at the local, regional and national. Preferred local resident (Location KAT) domiciled in Jakarta, Banten, West Java, Central Java, East Java and Yogyakarta. Willing to be placed and stay at one of the locations in the KAT empowerment throughout the country for eight (8) consecutive months starting in April - November 2017. Color photographs 4x6 cm (3 pieces). JobsCDC.com now available on android device. Download now on Google Play here. Please be aware of recruitment fraud. The entire stage of this selection process is free of charge. Kementerian Sosial RI - Recruitment Pendamping KAT Kemsos January 2017 will never ask for fees or upfront payments for any purposes during the recruitment process such as transportation and accommodation.